They are not generally fussy eaters and socialise very well with both people and other pets, they are great company, loving interaction with their owner. The Snowshoe is a lively breed that enjoys indoor living. It is affectionate and playful, yet laid back, combining some of the best personality traits of its parent breeds. Snowshoes can be bred in all Siamese point colours and have blue eyes. There are many variations on pattern ranging from the 'preferred' pattern, consisting of a white inverted 'vee' on the face and white boots, to a colourpoint which has no white points at all. Ranging between these two are Mitted, High-White, and Harlequin. Any variation of white can currently be shown at Championship level at FIFe and at Preliminary level at GCCF shows. The Snowshoe cat is a hybrid originating in America. 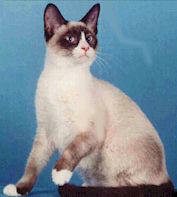 Snowshoe cats were first bred in the 1960's in the USA by a breeder of Siamese, Dorothy Hinds-Daughtery. She went on to develop the breed by crossing a Siamese and a bi-colour American Shorthair. Currently (November, 2005), there are approximately twelve breeders with mature queens along with female kittens waiting to join the breeding programme. The Snowshoe Breed is recognised by FIFe (Federation International Feline) and has preliminary status with the GCCF (The Governing Council of the Cat Fancy). The Snowshoe is still a rare breed.